This week we celebrated Earth Day! We read various books and had many discussions about the importance of caring for our planet. The children brainstormed ways that we could change our daily lives to better serve the Earth. Examples of this were riding bikes or walking, instead of driving cars; or remembering to turn out the lights when we leave a room. During Kindergarten Time the students completed a writing prompt on this topic. 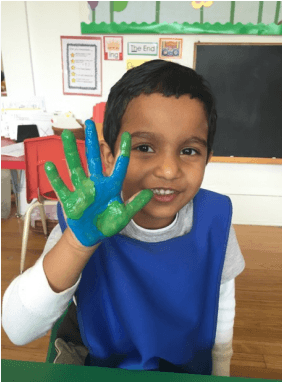 All the children who were present on Earth Day, created an Earth handprint to symbolize that with their hands, they can change the world.